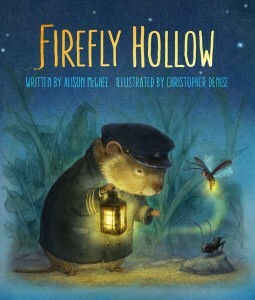 This recently published children’s book uses a familiar trope, the encounter of animal world with humans, and substitutes insects for animals. As always, humans are giant and unpredictable, except for the children, who have a different sensibility. While it could get old reading about humans and the rest of nature, Firefly Hollow adds a slightly new element. In the story, Peter, the child, is grieving for a friend who apparently died before the book begins. So we see some philosophical wondering about what happens after death. This theme is approached very gently, very intermittently, but with a sweet skill. Another element of this children’s book that is missing in some of the other human-nature fantasies is the way we change as we age. There’s a wonderful little piece about Peter’s father that brings the whole story to a lovely conclusion. It’s this part that especially makes this book stand out from others like it. This is a rather long children’s book for a read-aloud, but with the gentle drawing scatter here and there, and lots of visual metaphors, it could certainly work as a bed-time story. The many different messages are all appropriate for any age. Be forewarned that in the end, the cricket and firefly don’t go back to their homes. If you are looking for a message about staying in one place where you belong, this is not the children’s book for that. This is adventuring, a la Wind in the Willows.